Vancouver's Seasons Festival is set to take over the city for five days this April in the name of music, new media art and technology, and organizers have revealed the crop of acts that will grace the festival this year. 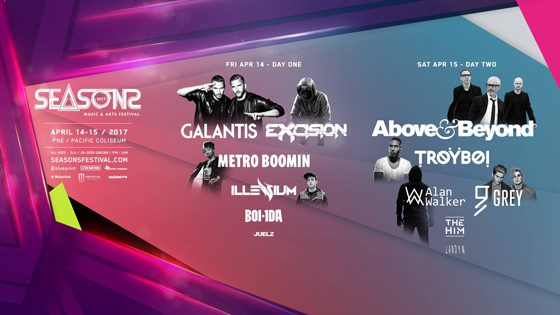 Topping the bill this year are Above & Beyond, Galantis and Excision, with other notables such as in-demand super-producer Metro Boomin, Boi-1da Playboi Carti, Kungs, Alan Walker, Illenium, Troyboi, Loco Dice, Bear Mountain and Grey following close behind. Rounding out the bill are Harrison Brome, Haywire, Hybridity, Lee K, Monstercat, Pacific Rhythm, Pat Lok (live), Pomo, Sam Gellaitry, Sosupersam, the Him, Throttle, Unlike Pluto, Yotto, Andromo, Apollo, DJ D. Dee, Expendable Youth, ESB (live), Femme Fatale, Generate, Hideout, Horsepowar, Iain Howie, I M U R, Jared Love, Jennifer Bass, Juelz, Kash Honey, Kempeh, Landyn, Live Evil, Locals Only, Loose Tizzy, Mike McSuede, Orri, Pacific Rhythm Selectors, Going Quantum, Re Up, Real Love, So Loki, Sofar Sounds, Tecumseh, Timelapse, You're Me (live), Wet Paint and Wmnstudies. And more artists have yet to be announced. Seasons Festival's 2017 edition runs from April 12 to 16. A five-day member access wristband can be had for $169.50, plus service fees, granting the wearer access to the two-day main event at the PNE Coliseum, nightclub and artspace events, and more. Further ticketing information can be found through visiting the festival's official website.